Step 1 If using professional-style frozen puff pastry, thaw a few minutes, then roll out to about 1/8-inch thick. If using commercial frozen puff pastry, allow to thaw up to 1 hour before rolling. Cut the pastry into 6 (5-inch) rounds and place onto a baking sheet lined with parchment paper. Step 2 Cut the stem end and bottom off each apple. (Do not peel.) Stand the apples up and cut them in half vertically; you'll need 3 halves. Core the halves, then very thinly slice each into half-circles about 1/16-inch thick. A mandoline works well. Cut the half-circles in half to form triangles. Step 3Combine the lemon juice and salt and brush on the apples to prevent discoloring. Arrange the slices on top of the pastry in a petal formation, starting 1/2 inch from the edge and working toward the center. Using a sharp knife, score the edge of the pastry 1/2-inch in from the edge about 1/16-inch deep. Brush the tarts liberally with the melted butter. Sprinkle the sugar over the top. Refrigerate the tarts 30 minutes. Step 5Bake the tarts on the upper rack, about 6 inches from the heating element, until the pastry is golden and puffed and the apples are slightly browned around the edges, 15 to 20 minutes. Keep an eye on them toward the end so that they don't burn. Serve immediately. In Recipes-list.com we have selected the most viewed recipes from category - Desserts . Enjoy the best recipes specially selected for you! 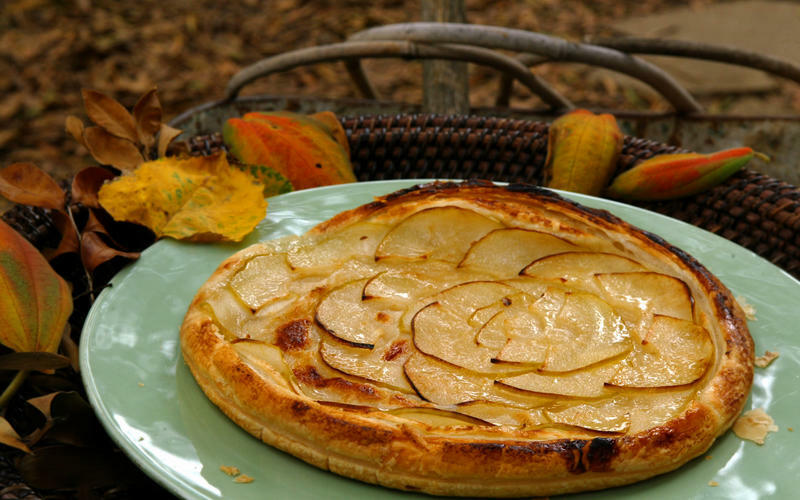 Apple tarts is the right choice that will satisfy all your claims.